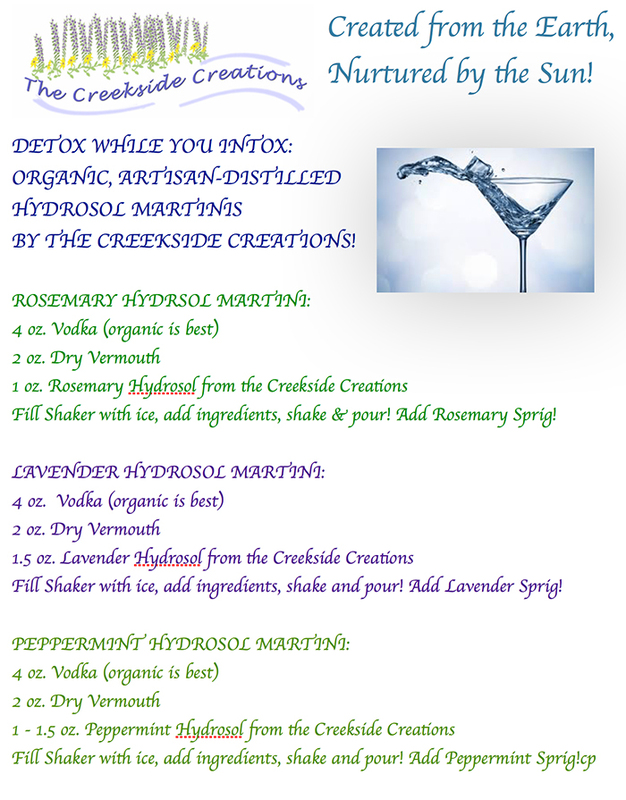 ORGANIC HYDROSOLS: THE NEW, HEALTHIER WAY TO IMBIBE! With all of the goodness that is contained in Organic Hydrosols, we need not reach for other flavorings for martinis and other cocktails. Our artisan-distilled hydrosols are created from organic plants in our gardens, harvested in early morning to preserve each precious constituent, and distilled with pure spring water in our copper stills from Portugal. No preservatives, chemicals or additives, our hydrosols offer the pure essence of every particle from the plant: therapeutic, fragrant, and delicious. The hydrosols, or floral/herbal waters, have strong aromas of the plant itself. Each hydrosol brings its therapeutic properties to your martinis, as well as the taste of a complete herb, both oil and water. What you get is a flavor that is herbal, well-rounded, and complete. Famous for unique martinis, the Novotel Hotel in Times Square, New York, uses hydrosols in many of their martinis; their clientele love the herbal notes and the purity of taste.